as well as optimizations for the PowerPC G5 processor and Mac OS X. Logic is now available from Apple Computer. 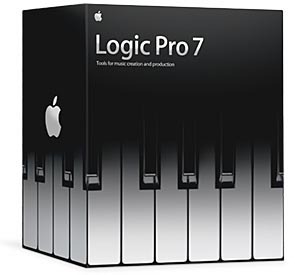 You can find Logic Pro 7 at an Apple Store or an Apple authorized reseller. Emagic continues to support its customers. The new distributed audio processing feature in Logic Pro 7 offers a plug-and-play solution that provides the ability to tap networked computers for more DSP processing power. Simply add one or more Macintosh systems via Ethernet or FireWire to your Logic Pro 7 system. 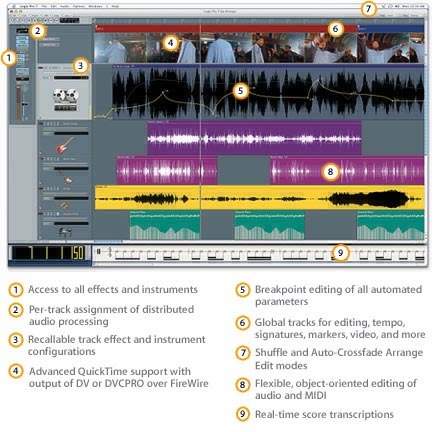 The result is an audio and music production system with processing up to 128 stereo streams. 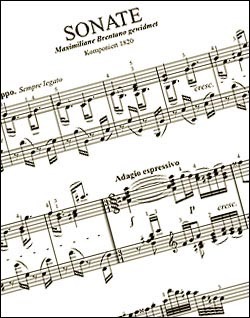 It supports audio at 16- and 24-bit resolution and sample rates of up to 192kHz for both audio recording and playback of internal software instruments. *Additional system requirements may apply when using Digidesign's TDM systems. A distributed audio network requires at least two Apple computers running Mac OS X version 10.3 or later, with one acting as a master system (1GHz G4 or faster recommended) and additional computers serving as “nodes” (G5 recommended). Logic node software uses each networked computer as an additional processor for your Logic Pro 7 system. You may install Logic Node on an unlimited number of Macs. Gigabit Ethernet provides the best performance. If you use more than one node, the switch that manages them must be Gigabit to avoid data transfer bottlenecks. Select which and how many nodes you want to use in the audio preferences depending on the needs of your project. A quick toggle in the Arrange window lets you take advantage of node power. Distrubuted audio lets you take advantage of more power in the studio, but if you want to compose while you're en route to the next gig, Logic lets you free up the needed resources. If the processor load of your system is approaching its maximum when adding a software instrument or plug-in, you can simply freeze another Audio or Audio Instrument track that you don’t need to edit at the moment. This lets you immediately take advantage of the CPU resources returned by the freeze procedure for sound generation and processing duties on the track you’re currently editing. Distributed audio processing let you link between a PowerBook and a Power Mac G5 in project studios. While the PowerBook makes for a reliable production and recording partner on the road, the Power Mac G5 is the ideal studio workhorse. Making them work together optimizes workflow and maximizes productivity. Swapping projects between the mobile computer and the stationary system in the studio normally requires fairly involved file management procedures to ensure that you've loaded both systems with the same samples, instrument and plug-in settings and audio files. Working with different audio hardware also means allocating the new Audio I/O to the Audio tracks and Audio Instrument tracks. Using distributed audio processing in your project studio allows all files to remain on the local storage media of the Master system , the hard drive of your PowerBook, for example. Starting work in the studio after collecting ideas while touring simply involves connecting your PowerBook to your studio’s Power Mac G5 via Ethernet. You can continue to work as usual, but with a boost in processing power. Distributed Audio Processing enables you to make full use of external studios instantly, and use expensive studio time. You can install the simple Node application, if it isn’t already on the studio Macintosh, and connect a standard Ethernet cable to the studio’s computer in a few seconds. This allows you to make full use of the studio without leaving the setup you’re familiar with.